We had high hopes for B•AN•C House in Norwalk after getting a few recos to go there and getting lost in the idea of finding another great BBQ joint. After all, we had just come down from our BBQ high from judging the Blues, Views & BBQ festival in Westport and had a great meal at Bobby Q’s just weeks before that. So, I will start with the caveat that maybe we came in with over inflated expectations. To start on a positive note, they have an awesome patio for outdoor dining and a huge bar area – it’s really a great set up! Since it was still 60 degrees out, we decided to sit outside and immediately dove into our menus. Just on first glance, we were impressed by the variety of seafood, BBQ, starters and sides but we were a bit annoyed. Unlike most BBQ joints up here, you have to order all your sides separately because they don’t come with the meals. Actually, you’ll get two sides if you order lobster or crab meals, but those are already picked for you, you can’t pick the sides you like. So, if you want the goodies, ya gots ta pay up. And pay we did…it was a damn expensive meal for BBQ. The most expensive BBQ spot we’ve ever been to, actually. Cost aside, the sides did look promising: corn puddin’, mashed sweet potatoes with glazed pecans, mac & cheese, salt and pepper house cut fries, and poutine. Yes, poutine my Canadian friends. So many fond experiences of spending $2 at IHOP in college (that was a lot back then) up in Plattsburgh. Fries, covered in gravy, then covered in cheese. It’s the Canadian national diet, eh. Bacon dates, mashed sweet potatoes with glazed pecans, and mac & cheese to start. Spoiler alert: This is the ONLY awesome part about our meal. And when we say awesome, OMG were they awesome! Just melt in your mouth amazing. 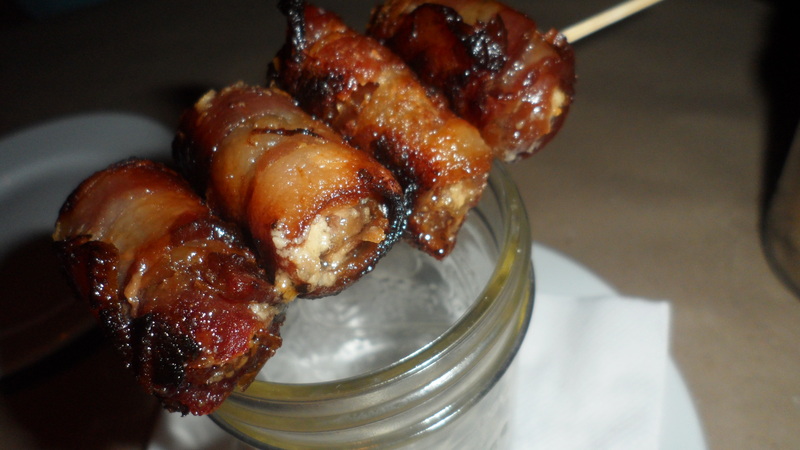 Warm, gooey and sweet dates wrapped in salty, crispy, smoky bacon. Four per skewer, people. Think about that when you order. You might need at least two to three skewers. The best thing we had all night, no doubt. The mashed sweet potatoes were decent, but the glazed pecans on top are what really made it. We just wish there were more pecans. What was left when we finished the pecans was a relatively bland puree. The mac & cheese was served al dente with a grainy mild cheddar sauce. Despite the graininess which we didn’t like, the breadcrumbs and the flavor made this a decent mac & cheese. Certainly not in the same caliber as Burger Bar & Bistro’s mac & cheese. No sir! Lobster special with risotto for Kristien. 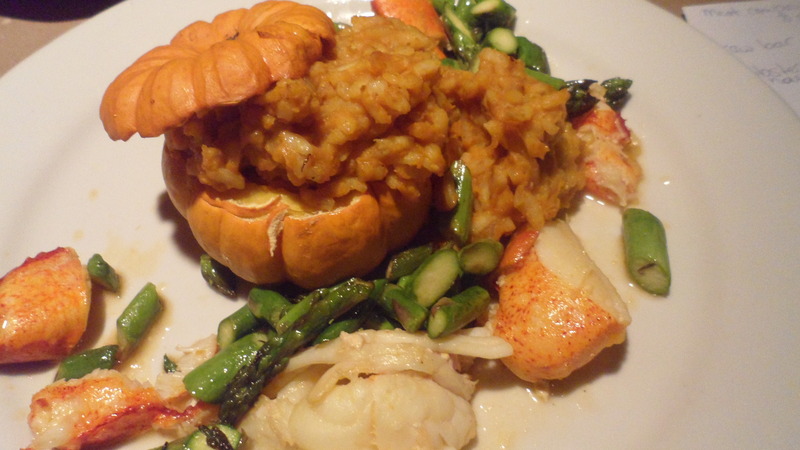 This was a lobster cooked in a subtle vanilla vodka sauce with pumpkin risotto served inside of a sugar pumpkin. The lobster nibs had decent flavor but were slightly overcooked. Overcooked lobster makes us sad – so much hope, so much money, gone with a rubbery bite. Unfortunately, the dish just got worse from there. The risotto was a giant overcooked lump of mush. Yeah, worst risotto we’ve ever had. The flavor combos overall just weren’t working. …and this was hell. So sad, so so sad. The Cogburen (baby back ribs, 1/2 chicken, and sausage) and some french fries. First I had the baby back ribs. There was a nice BBQ coating on the outside, but the ribs were dry on the inside. The only moist parts of the ribs were those little bits of meat in between the bones. Next, was the chicken. The skin was burnt almost everywhere and when I tried to dig my fork in, I knew that I was in for trouble. The fork didn’t budge because the meat was way too dry. I usually devour my chicken, but that breast remained untouched because it was too chewy and inedible. Not wanting to waste it, I did bring the leftovers home to our dog Maynard. He liked them, though. In between bites, I had some hand cut fries. They had nice flavor seasoned with sea salt, but they were soggy. Finally, I had the sausage. Sadly, this was probably the worst BBQ sausage that I had ever tasted. It, like everything else I had, was way overcooked and was drier than the freaking Sahara. Yeah, it was sad. 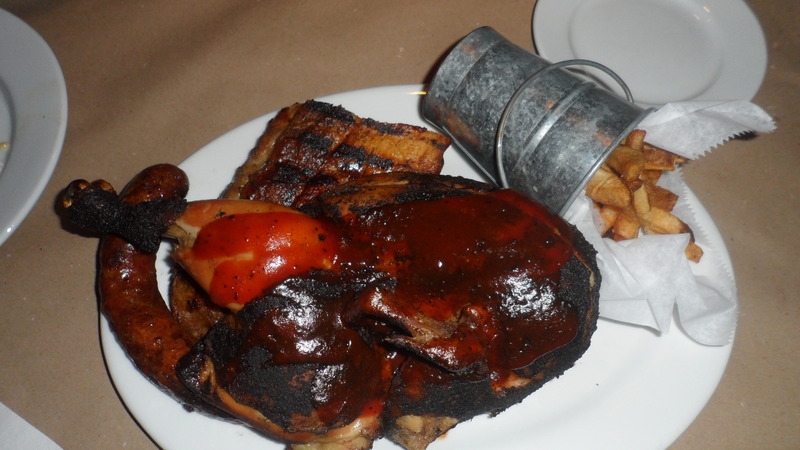 Makes us appreciate really good bbq and bbq that we thought was expensive, but we realize isn’t too badly priced, too. :) Joey, I’m making a chili for a contest at school. I’m planning on winning. Got some chilis hydrated and now they’re soaking in olive oil, all ready for Thursday’s cooking extravaganza! that sounds good – need any chipoltes?